I decided it was time to have a go at colour processing. I’ve done plenty of monochrome over the years, but I’ve always shied away from colour because of its apparent cost and complexity. However, I recently shot a batch of expired Ektachrome 100+ (EPP) with the intention of cross-processing it. Under the circumstances I figured I had nothing to lose by trying to process it myself. 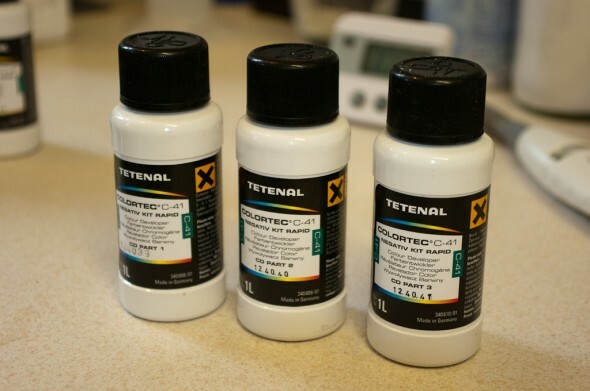 The kit I used was Tetenal’s Colortec C41 (1 litre). It’s available from Silverprint and Firstcall for less than £20. 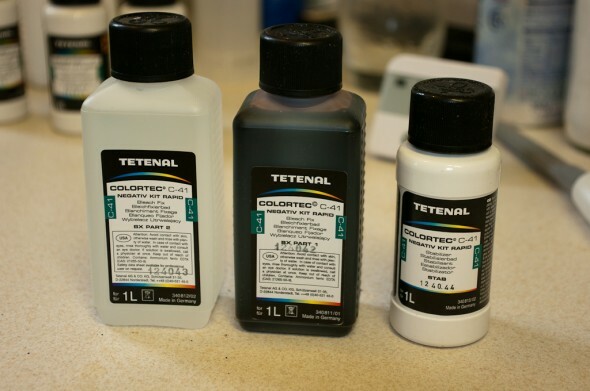 It comes as a 3 part developer, 2 part bleach/fix, and stabiliser (all in liquid form). When mixing, the developer starts off clear, turns reddish-purple, and then yellow. 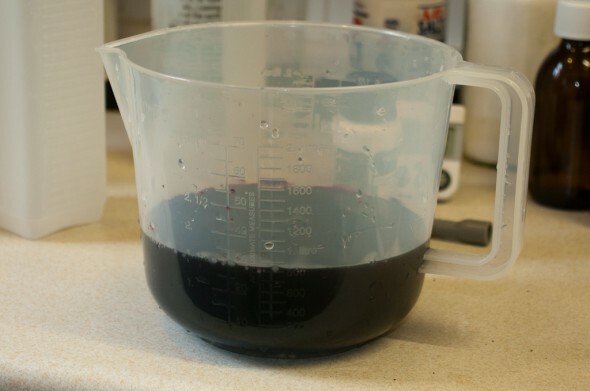 The blix is a deep permanganate red and smells quite strongly of bleach, as you might expect. I mixed all of these at around 40C. The temperature isn’t critical at this stage but you want the water warm to make mixing easier. The rest of the process is very similar to monochrome just at a higher temperature. Keep the solutions in a water bath at 38C, maybe a degree or two warmer. Prewarming the tank/film is recommended. I filled mine with warm water (~38C) and let it stand for a few minutes. This is a good time to tweak the temperature of the water bath to get the developer to the perfect temperature. Dunk a thermometer in the developer and when it hits 38C you’re ready to go. 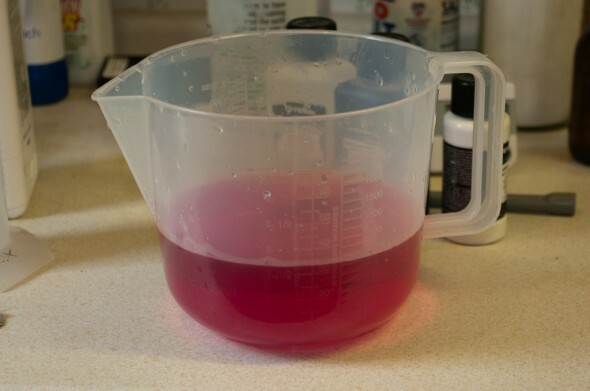 I found the prewash water was yellow orange with C41 film and dark pink with E6. This is perfectly normal so don’t worry, your images are not washing away! Rinse: for this is used Ilford’s rinse method. Fill the tank with warm water, do 5 inversions, dump the water. Repeat with 10 inversions and then 20. The times are relatively short relative to monochrome processing. This made things feel a bit more of a rush and does mean that good agitation is vital. I opted for an initial 30 second agitation (full inversions), then 4 inversions every 30 seconds. Some recommend every 15 seconds. The stabiliser is also the final rinse. 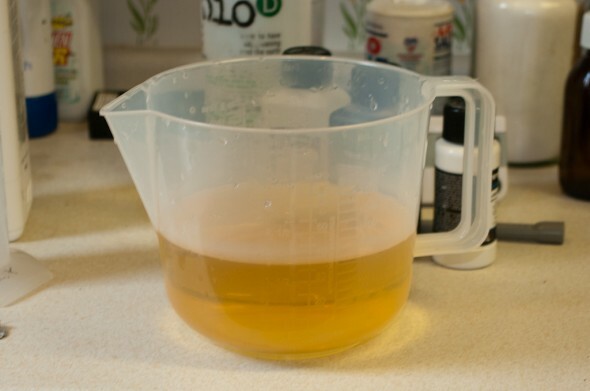 You should not rinse again, the chemicals are meant to be left on the film. For monochrome I would normally do a final rinse in Ilfotol (wetting agent) to reduce drying marks. Some sources suggested adding a drop or two to the stabiliser but as I noticed it frothing slightly during mixing I figured there was some wetting agent in there already. 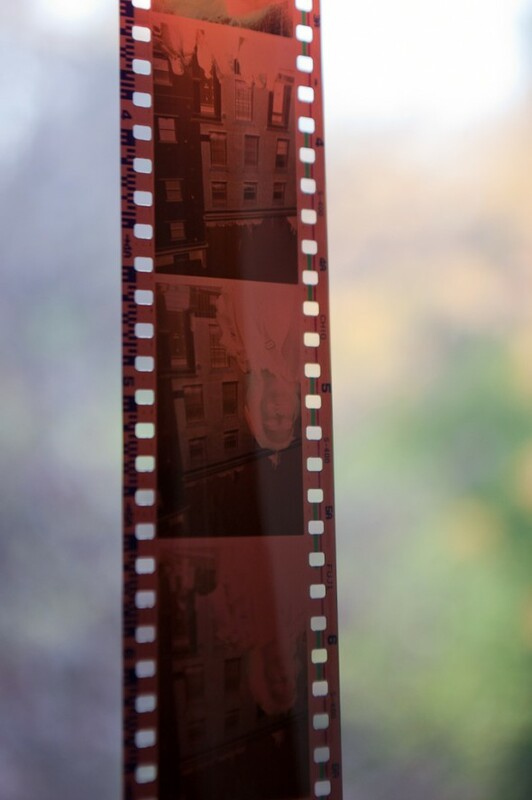 In the end the film dried just fine. My first roll was some Fuji Superia 400 C41 35mm. This came out looking fine, negative denstity looks OK and the development seems to be even. I can’t say anything about the colours until I scan it. 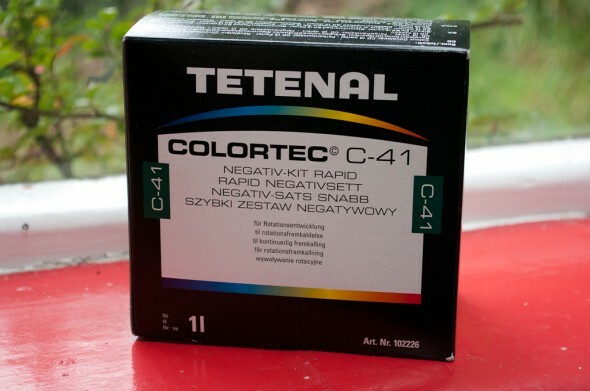 I also processed 4 rolls of Ektachrome EPP. Obviously as this is an E6 film the result was a cross-processed negative. The negs look very dense but then I did err on the side of over exposure when I shot them. I’ll know more about the grain, contrast and colour shifts when I get them scanned. Overall this first foray into colour processing was a success. The process is relatively straightforward, especially if you’ve already done monochrome dev. I was relatively careful with temperatures and timings but not obsessive as the film was all expired anyway. If I was processing important images I would prefer to have a thermostatically controlled water bath. This entry was posted on Sunday, October 30th, 2011 at 9:51 pm. It is filed under Photography. You can follow any responses to this entry through the RSS 2.0 feed.